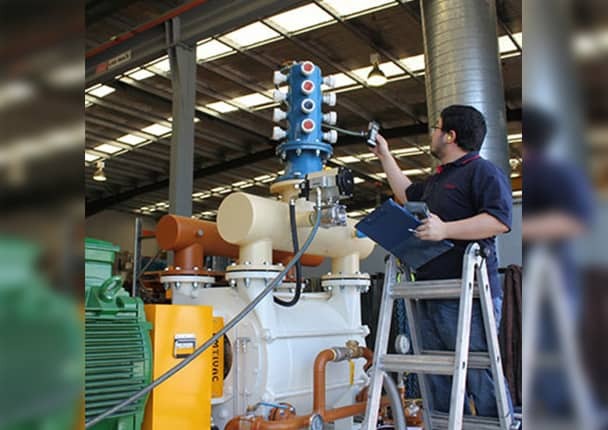 Systematic maintenance and servicing of vacuum pumps helps to prevent breakdowns in production and improves the availability of the system. For diagnosis of the pump as well as for executing maintenance work the achieved minimum pressure and the pump-down characteristic have to be recorded. These factors provide essential information about the actual condition and performance of the pump. A VD85 with wide range combination sensor is capable of capturing the minimum pressure of many pump types like diaphragm, scroll or rotary vane pumps. In addition the instrument can measure and – on demand – record the complete pump-down cycle from atmospheric to end pressure. In this case the vacuum meter is used as data logger which stores the measurements in the internal data memory. Via USB interface those data can then be transmitted to a PC for further analysis and documentation.